A family owned and run vineyard and winery located next to the Chehalem Ridge Natural Area southwest of Portland, near Forest Grove, Oregon. 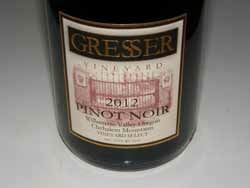 The two Pinot Noirs offered are from the estate vineyard which is farmed organically. The vineyard is planted on a steep slope at about 900 feet elevation (one of the highest vineyard sites in the Willamette Valley) to UCD 29 (a Jackson clone) and Dijon clones 113 and 115, making up a unique clonal mix for an Oregon Pinot Noir vineyard. Owner Paul Gates grew up near the commercial wine center of Lodi, California, and worked in the local vineyards as a teenager. He studied enology at California State University at Fresno, and worked in wine stores. After graduation, he moved to Oregon and worked in the cellars of four large wineries before planting his own 4-acre vineyard in 1998 with spouse Lori. Gates and his two sons farm the vineyard mostly organically and the steepness of the vineyard and tightly spaced rows of vines require that they farm the vineyard largely by hand. The fruit hangs but 14 inches off the ground to absorb the heat reflected off the soil below. Of interest is that the winery's crusher-destemmer is powered by bike pedals. The winery is able to process 30 tons of fruit each harvest by pedaling. 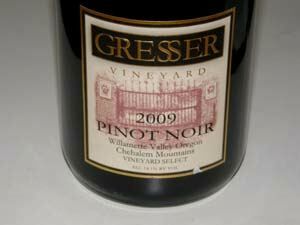 The wines are extremely well priced considering the high quality.